When performance and security are paramount, one modem offers you all the advantages of the latest in high speed communications technology – the DPX-368. The DPX-368 is ideal for applications where fast, reliable and secure data transfer is required. Top performance is guaranteed with advanced DSP and improved data compression techniques, even over poor lines. The DES encryption module coupled with integrated dialback security and password authentication ensures your system is always protected from unauthorised access, eavesdropping, malicious damage or accidental reconfiguration. When you require access to your Lan over the dial-up network, the DPX-368 is the ideal product. It comes equipped with a built-in Ethernet LAN port. This feature coupled with the modem’s high performance capability represents a comprehensive solution to all of your LAN access needs. Just plug an DPX-368 modem into your Ethernet LAN and users can immediately dial into the LAN and access their LAN-based applications and services. The DPX-368 supports PPP (Point to Point Protocol) and you can use standard PPP dial-in client software packages on a remote PC or laptop, and even Apple machines. The DPX-368 also supports dial-up multi-user LAN to LAN as well as single user Client to LAN connections. The DPX-368 is a full featured modem designed to meet the critical demands of commercial and professional applications. The modem provides high throughput on dial or leased lines – up to 115,200bps, together with V.42bis/ MNP 5 data compression, V.42 error correction, system security and full fax capability. The DPX-368 has been developed to provide a simple cost effective solution to your Remote LAN Access needs. The DPX-368 has been designed to meet the critical demands of commercial and professional applications. The DPX-368 provides reliable high throughput LAN access capability with the ease of use of a conventional modem. The DPX-368 connects directly to your Ethernet UTP LAN to instantly provide Remote LAN access capability with the minimum of fuss. Configuration is achieved through the use of the Serial DTE port on the standalone desktop model or via the AccessPoint-Manager with the High Density Rackmount version. The DPX-368 supports the common PPP (Point to Point Protocol) for connections to industry standard PPP Client Software packages, for example, Windows 95 and Trumpet Winsock. By connecting an DPX-368 to your Remote LAN (as well as your Central Site LAN) you can provide a facility for automatic LAN to LAN dial-up connections. The connections can be established and terminated automatically without any user intervention. As well as connecting to another AccesPro34E, the DPX-368 can connect to your existing PPP LAN Access Servers. Advanced Digital Signal Processing, on-line rate renegotiation and adaptive equalisation ensures that the DPX-368 delivers accurate data over the widest range of phone lines. Selective block retransmission, V.42bis and MNP 5 ensure the highest possible throughput and economy for all users on all lines. 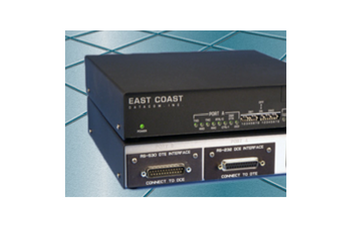 The DPX-368 is ideal for high volume traffic on expensive long distance lines or any application where fast, low cost error free data transfer is required. Incompressible files can be sent error free at 33,600bps – even with DES encryption enabled. Password verification and same line callback help protect your system from unauthorised access. Once configured, the DPX-368 cannot be maliciously or inadvertently reconfigured by any interface or line commands. Auto-logon allows users to bypass the normal password entry sequence – the modems transparently exchange a password before going on-line. Top security is achieved by enabling DES encryption. To ensure the security of your network is not violated, the DPX-368 supports user authentication based on the tried and proven AccessPoint-Security system. Diagnostics include LEDs for on line activity display, local and remote loopbacks, AT commands or V.54 signals, plus inbuilt test pattern generation and checking. Manufactured under an IS0-9001/AS-3901 quality control system, the DPX-368 offers an advanced design with minimum parts count for maximum reliability.